Before starting the topic I would like to tell you that the niche of SEO or web positioning does not have a high rate of traffic but there are certain searches that can get you a very qualified traffic. 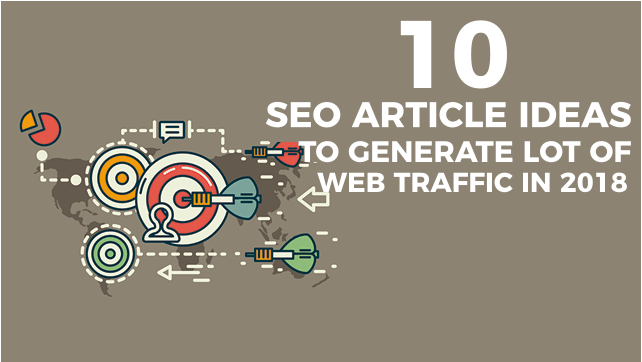 With these 10 SEO article ideas, you can generate good web traffic in the next 2018 or instantly, depends on your smart work. But the truth is that I see many blogs that write about things that really generate little or no traffic. So I thought about doing a small study and tell you what are the SEO articles that should be in an editorial calendar, because they are the real topics that work very well and key to get thousands of monthly visits to our blog/website, as well as get thousands of leads and income through affiliate marketing. Reading only side headings will not give you any important information. Depth reading is important if you really want to increase your web traffic. #Idea 1: What is SEO and what is it for? The articles of definition and introduction to a theme tend to attract a lot of web traffic because they tend to coincide with long-tail niches, so we will be able to generate organic traffic from hundreds of keywords in which we can position it. Another option of the title could be: What is SEO and how does it work? There are really are several variants that we can use. But do not just stay in the definition and a theoretical content, talk about positioning strategies and most important SEO tools and then write a complete article. The SEO Guide for beginners is a classic and I’m sure it will be a good idea to add to your editorial calendar. For example, write an article with title SEO Guide for Beginners + 8 videos, and update every year with fresh and advanced techniques according to your experiences. This results in good Page Authority (PA) and can get a better position on the web. Estimation of traffic: 3,000 to 4,000 monthly visits. Note that this corresponds to a very natural search and that could be deduced very easily because it is one of the objectives we all seek, position our page in the Google search engine and thus have more visibility and traffic. For example, This excellent content can capture many leads and if you are giving any SEO course, you could have a good conversion. Making a complete manual on a specific SEO tool can be a great idea to position ourselves as someone who knows the tool well and at the same time gets a constant traffic of high quality. But something you have to know is that the level of competition will be very high because there are professionals in this sector who want to position themselves with a specific tool, so it is something a little difficult task. Always, try to exhibit in a unique way with infographics, video tutorials, images, screen recording, etc to attract a high number of visitors. If you do a great job you can get a link or recommendation from the tool itself, to which the domains with a lot of authority. Estimation of traffic: From 1,000 to 20,000 visits per month. Making an article where we talk about the advantages and disadvantages of SEO and SEM can help us capture traffic from a beginner audience who wants to learn or introduce themselves in each of these areas. But do not stay in the theoretical plan but also add tips and tricks on how to start using it to give the article a more practical touch. Estimation of traffic: 2,000 to 3,000 visits per month. A good idea of the article is to base it on some of the errors that a web page can give us, the most known errors are the 404 error and the 500 error. But not only to explain what it is but also explain how you can correct or solve this problem and what diagnostic tools we can use. Estimation of traffic: 10,000 to 12,000 visits per month. An essential and necessary element to position a project on the Internet is to have a good hosting service, so to make an article where you recommend the best hosting will surely have a large amount of monthly traffic. Estimation of traffic: 4,000 to 6,000 visits per month. This is perhaps the most used and one of the most common topics in any editorial calendar of an SEO blog, but not by the amount of traffic we get but by its ability to convert either in leads or money through links of affiliates. Make a very powerful guide where you explain how to position your videos on the YouTube channel is an excellent idea. If you want to convert it, offer a free course to your visitors. With this idea we could kill 2 birds with one stone; One is we would attract links that help us to position the keyword, and the other is, we could attract a large number of subscribers to the blog. 20 best SEO blogs in India in 2018. 20 SEO plugins for WordPress in 2018. 20 SEO extensions for Chrome and Firefox for 2018. Estimation of traffic: 5,000 to 10,000 visits per month. These are the 10 SEO article ideas from my end. I hope these copywriting ideas will help you to increase your web traffic in 2018. Start implementation to see the real results. If you have any queries regarding any of the above ideas, let us know them in the comment section and we will get back to you as soon as possible to solve all your queries. Would you like to add any other SEO article ideas to this list? Then write them in the comment box and we will include them in this article in the next update once the analysis is done. Which idea do you think your blog can get more web traffic in 2018? Great content! Found some good ideas for my next blog post. Thank you!